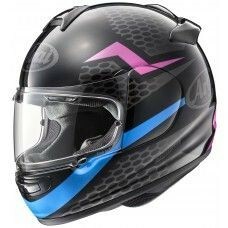 The RX-7V really shows off the peak of Arai's knowledge, experience and expertise in helmet technology. 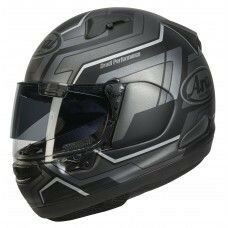 With a new style shell and visor system this helmet really offers a new standard in premium helmet. 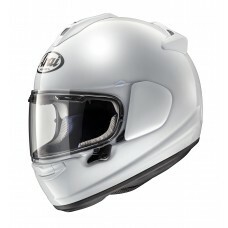 Also this helmet has an improved liner along with enhanced diffusers and air vents. 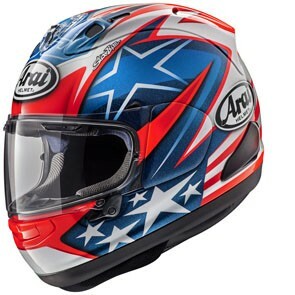 This new colourway is in honour of the late MotoGP champion World superbike star Nicky Hayden. 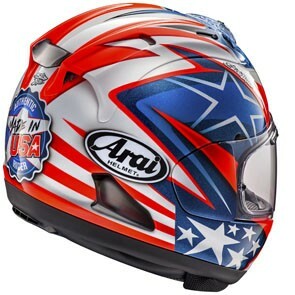 Arai uses a net structure core, assembled and bonded within Super Fibre and other special synthetic fibres. These special fibres are also used for the visor panel of F-1 helmets and have superb characteristics in tensile strength and flexibility. 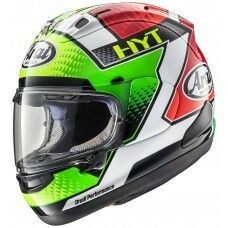 Our shells are carefully moulded with multiple material layers including a Super Fibre belt across the helmet, just above the visor opening for extra strength. We have also developed a new resin in pursuit of a lightweight but very strong shell.